Located 200 metres from Oslo?s main street, Karl Johan?s Gate, this hotel offers rooms with DVD players, tea/coffee makers and free Wi-Fi. The Stortinget Metro Station is just around the corner. P-Hotels Oslo?s breakfast package consists of a sandwich and fruit, delivered to each guest room. During daytime, free hot drinks and fruits are available in the lobby. Within 20 minutes? walk of Oslo P-Hotels is the vibrant Aker Brygge district, which has many restaurants, bars and shops. Oslo Central Station is less than 15 minutes? walk from P-Hotels Oslo, and the Oslo Gardermoen Airport shuttle stops right outside the door. 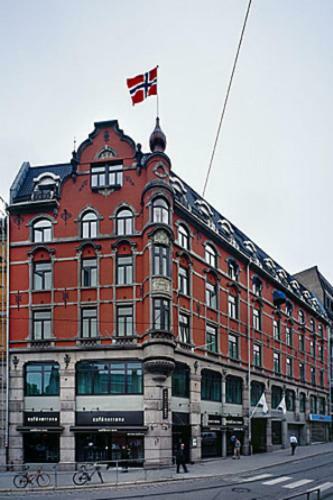 Please note that P-Hotels Oslo only accepts payments by credit card. Official travel guide for Oslo with updated info on hotels and accommodation, map, tourist information, congress, attractions, activities, concerts etc. P-hotels Oslo, Centrum, Oslo, Accommodation. Read independent author reviews and book online with Lonely Planet Hotels and Hostels.